The Slingbox place shifting devices have been given a boost after Sling Media released an updated SlingPlayer app for both Android and iOS, and have also now added support for the popular Roku internet TV players. Users with a Slingbox device at home and running SlingPlayer software on android and iOS phones or tablets can watch live or recorded TV streamed using 3G, 4G or Wi-Fi anywhere around the home, the Country, or even around the world. The service lets users control the TV and DVR recordings/playback from mobile devices and now Roku. 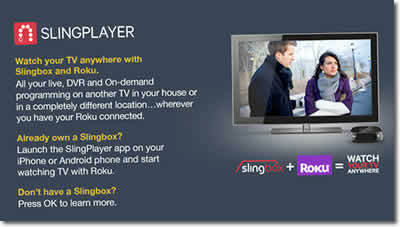 The Roku feature adds a dedicated Roku channel for Slingbox users to make streaming of live and recorded cable television easier. Roku compatibility extends to Roku 2 XS, Roku 2 XD, Roku 3 and Roku’s Streaming Stick. Compatibility with the Roku LT, Roku 1 and Roku 2 models will follow soon. The new SlingPlayer 3.0 app has also been released for iOS devices bringing an improved split-screen interface for finding content. Sports fans get better channel information and in-game stats, real-time scores and other facts. The app also includes more in depth social media integration with Twitter and Facebook. Sling Media who released new Slingbox models last year have also revealed they will release a Windows 8.1 SlingPlayer app in December that will work on Surface tablets and computers.